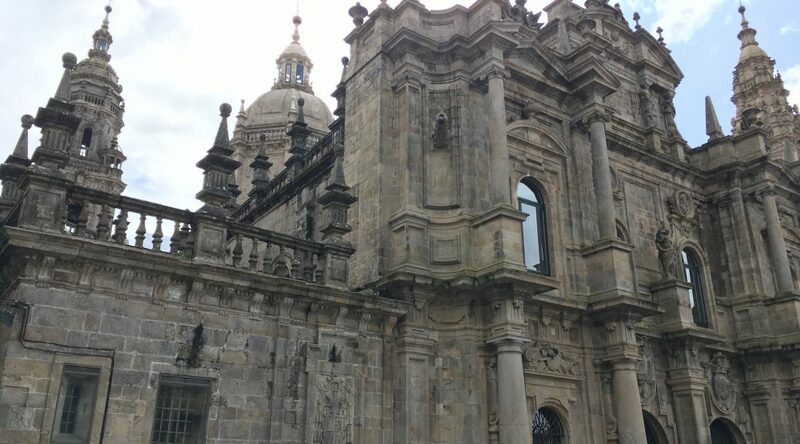 During Semana Santa (which was essentially my Spring Break) I walked 165 kilometers of the Camino de Santiago, an ancient pilgrimage ending at the Cathedral of Santiago de Compostela. 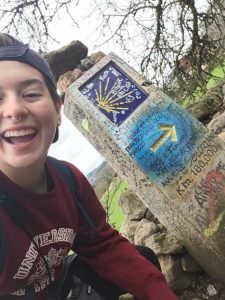 I walked for 8 days, with my only goal being to each day get closer to Santiago. 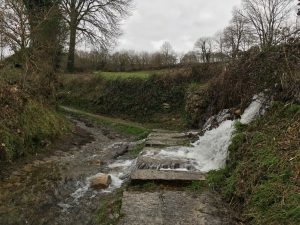 There are many different routes, but I walked along the French Way, which is the oldest route and one of the most common for pilgrims nowadays to take. I began my camino in O Cebreiro, which is the first pueblo on the French way in Galicia, a northern region of Spain. Walking the camino has been a dream of mine since I began to learn Spanish, and I know that I couldn’t spend a semester in Spain and not do this. My program ends May 18th but I don’t fly back to Chicago until June 1st, so my original plan was to walk the camino in my final week of being in Spain. 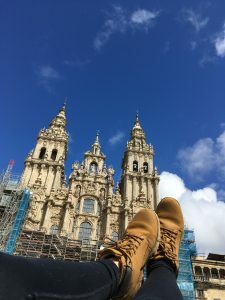 A few weeks before Semana Santa I realized that if I were to swap trips around and do my camino then, I would have 10 days to walk rather than 5, so that is what I did. What that meant though, is that I had to prepare for this 165 km (approx. 100 miles) journey in just a few weeks. I have always loved the outdoors but I had never gone on a hiking excursion like this before, meaning that I had no idea what in the world I was getting myself into. I began to do what I do best– aggressively research and make so many lists to feel somewhat in control of this situation in which I couldn’t even fathom what to expect. I am a planner. I plan down to the detail because planning, for me, takes away the a bit of the anxiety about the unknown. I made an excel document detailing which place I would end up in that night, and which albergue would be the “best” to sleep in, but after day one, I ended up disregarding my carefully detailed work. Regardless of how much I wanted to plan, this was a time where I needed to give up control and just exist. Now, that sounds like a lovely thought, and now it is, but I figured this out because the first day I was on the top of a mountain in a middle of a snowstorm. 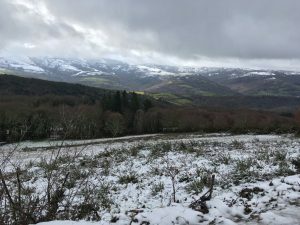 I arrived in O Cebreiro the night before to find a pueblo covered in snow (it felt like a whole different world than Salamanca, which, that same day, was 60 and sunny). 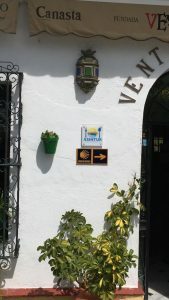 I was told by the woman working at the albergue that the following day we would be unable to walk on the pilgrimage trail, but rather we would have to follow the highway until a pueblo named Triacastela. I immediately asked myself what I had gotten myself into, and in that moment I felt entirely underprepared. 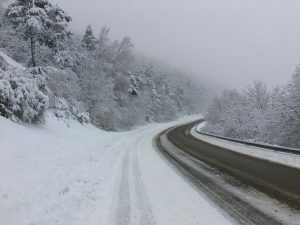 I hadn’t planned on arriving in Triacastela until my second night, but that first day I hiked there along the highway and through a snowstorm.I arrived to the public albergue freezing cold and soaked to the bone, but I had arrived. Despite the wretched weather, you are always greeted by other peregrin@s with the greeting buen camino. 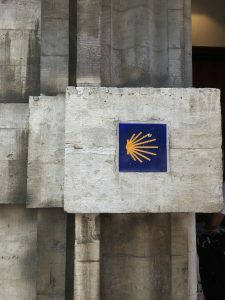 All along the camino you hear this being spoken between pilgrims, as words of encouragement, solidarity, and community. 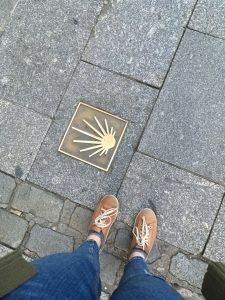 That first day, I began to develop my camino routine. Each night (minus the ones in Santiago) I stayed at the public albergue in the pueblo. The region Galicia has a network of public albergues solely for peregrin@s, meaning that you needed the pilgrim’s credential in order to stay there. Each morning we had to be out of the albergue at 8 am, which meanta 7:30 alarm so I could throw on clothes, brush my teeth, and pack up my bag. Most mornings I got breakfast in whichever pueblo I slept in, and then I walked until I reached the next place I would be sleeping, arriving anywhere between 1 and 5 pm. Most of the time, I had no idea where I was. Along the camino there are yellow arrows marking the way, so you never had to think too hard about where you were going. A man I walked with for part of a day said to me, “out here, there are only two names for towns: the next and the last.”When you’re walking, pueblos come and go as you walk through, and time doesn’t really seem to exist because your day consists of walking and sleeping. This disconnect from reality brought me a lot of peace– I didn’t have to think about anything except putting one foot in front of the other until I reached the next town. I walked the camino sola, by myself. Before leaving, both my real parents and host parents were worried about me going out into the mountains by myself for ten days, but doing so allowed for me to have one of the most incredible experiences of my life. 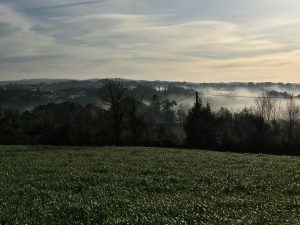 I began my camino with the intention of using it as a time of reflection and to spend time being connected to God through prayer and nature. I left everything happening in my life back in O Cebreiro, so I was able to focus my energy on being with God. The first day of walking I listened to the playlist I had created beforehand, but the more I walked in silence the more comfortable the silence became and the more out of place the music felt. There were times when I walked with others, but most of my time was spent by myself, in silence, surrounded by incredible beauty. 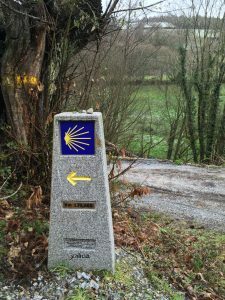 When I did run into other peregrin@s, though, I was welcomed with open arms– there is a wonderful community of support between peregrin@s along the camino. After about a week of walking, I arrived in Santiago de Compostela. My last day was about a 20 km walk, and it poured the entire way. I arrived at the cathedral the same way I arrived to my albergue the first day: soaked to the bone and freezing cold. But this time, it was the end of a journey rather than the beginning. The cathedral was more beautiful than I could have ever imagined. I returned to the cathedral more than once so that I could really take in everything. 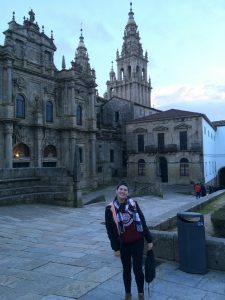 After my first visit, I went to the oficina de peregrinación, so that I could “officially” complete my camino by receiving the Compostela stamp in my credential passport. The reality that I had arrived didn’t start to set in until the next morning, when I didn’t have to wake up at 7 to walk more. I spent the next day and a half exploring Santiago, visiting the Cathedral, and reflecting on the experience I had just had. After that week, I felt closer to God than I had thus far while living in Spain. I had intended to use my camino to be in conversation with God and to strengthen my relationship with Her. I was on a Jesus high, and as always, I didn’t want that feeling to leave. Going back to Salamanca, I felt at peace. My entire body hurt, but my soul was calm. I was utterly exhausted, but recharged at the same time. 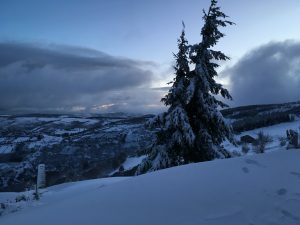 There were points on my camino where I felt a jealous of my friends who were spending the week traveling to places like Amsterdam, Berlin, and Budapest, whereas I was in the mountains, walking until my body couldn’t take anymore. Ultimately though, I wouldn’t trade this experience for anything. Since coming home from Santiago, I have begun to notice the indicators for the camino wherever I go, and each time I see one I feel at peace again. Seen in Cádiz, Salamanca, and Brussels!